1. Fixed quantity by computer and auto ejection control assistant equipment make ejection quantity more precise and it is easier to operate. 2. Multiple security protection system ensures operators and moulds. 3. The whole machinery is working by hydraulic system. Poweerful mould locking and exact mould clamping make products no burr. 4. With special logical oil way design, it is high speed, high efficiency and high capacity. 5. With hydraulic shifting equipment, it is stable, noiseless and located exactly. 6. Refined temperature control system and preheating mould equipment make products bright without waste. 7. Auto monitoring system makes it easy to maintain. 8. Single-color and two-color production can be done at the same time. 9. Auto operation system coordinating with robot arm saves manpower. 10. It is easy to put on inner lining for the special structure of mould case, and the worth of finished products is great. 11. 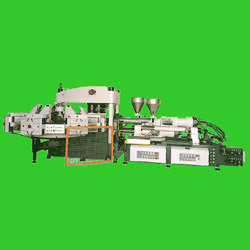 Unique fold type ejecting equipment makes great output and best moulding effect. 12. The equipment of mould case makes long duration of mould and it is need not to maintain. 1. Mould dimension: 700 x 660 x 188m/m. 2. Mould station: 8 stations. 3. Mold clamping force: 160 tons + 60 tons. 4. Ejective capacity: 1320gm + 240gm. 5. Heater: 40kw. 6. Pump horsepower: 25HP x 2 + 15 HP x 1. 7. Total electric: 90kw. 8. Machine size: 12220 x 4020 x 2570m/m. 9. Machine weight: 33000kgs. 10. Packing dimension: (1) 5300 x 2420 x 2630m/m. (2) 4250 x 2280 x 1965m/m. (3) 1980 x 1450 x 1185m/m x 3. 11. Packing weigh: (1) 19000kgs. (2) 10200kgs. (3) 1800kgs x 3.